Shiv found out about Young London Working from his Jobcentre advisor. He was struggling to find work having just finished University and was getting himself into a rut. 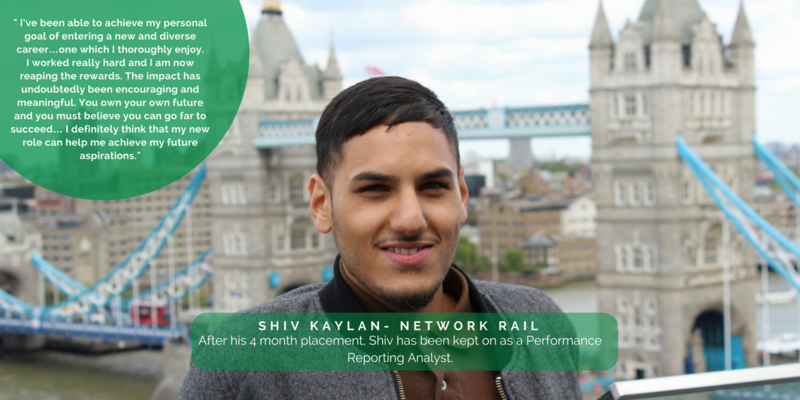 Through his own determination and the help from us, Shiv started at Network Rail on a 4 month work placement and has since been kept on. Before you got the role with Network Rail, what were you doing? I was out of university, unemployed and actively looking for a job through the job centre. That’s where I was introduced to Young London Working and Michelle. How did you find the support of Young London Working and their Advisors? To be honest Young London Working got my foot through the door, I didn’t even know that they ran such fantastic opportunities such as Network Rail. I thought Network Rail was just a train company but it’s the complete opposite. I was so naïve and have learnt a lot. It has opened my eyes so much and it’s all thanks to Young London Working. What was the process like, from finding out about the role and applying, through to getting the job? I found the process of Young London Working so efficient and very streamlined. Within the space of 1 week I was contacted by Michelle to be prepped for my telephone screening, interviewed and was successful! Have Young London Working been in contact to support you while in your role? I was in constant contact with Michelle, we used to meet every 2 weeks for 4-5 months on my placement and we even keep in contact now, it’s always nice to let her know how I am doing! What impact has getting this job had on you? I have been able to achieve my personal goal of entering a new and diverse career, one which I thoroughly enjoy and in conjunction with a fantastic organisation to work for. The impact has undoubtedly been encouraging and meaningful. How have you found the support of your managers while at Network Rail so far? Absolutely amazing they have enabled me to have free reign in my role. Genuine relationships have been built which is fantastic. What is your new role with Network Rail after your placement? My role is a PRA ‘Performance Reporting Analyst’ it’s a shared resource role within 3 teams such as health & safety, programme control and environment teams. I will be the main point of contact for data analysis. I will look at all relevant data and present this to the 3 teams. What advice would you give other young people who are unemployed and struggling to find work? At the end of the day it’s about being proactive and to not just twiddle your thumbs. I didn’t get the job with Network Rail by just walking in to it, I worked really hard and I am now reaping the rewards of this. You should also be resilient as rejection is never easy to take and this will happen a lot. You must have the mental strength to persevere through this as I have been in this position myself but it gets better even when you think it won’t. I would also say you have to be really self-motivated because it is so easy to just get in to a rut whilst unemployed. You own your own future and you must believe you can go very far and succeed. Finally I would say you need to be prepared, research & understand what you need to know in order to gain employment and to establish a rewarding career. What would you like to be doing in your career in 5 years’ time? Do you think this job could help you get there? I would like to be leading new and innovative analytical approaches for future projects within Network Rail. I definitely think that my role can help me achieve these aspirations. I also feel like I need to give back to all of the people at Young London Working and would love to join the youth board! START A JOURNEY OF YOUR OWN TODAY!